I don’t know what this affliction stems from. Could it be the fear of getting stuck in a holiday rut? Or maybe the concern that second experiences never quite live up to that virgin exploration? Whatever the reason, for years now I’ve followed an unspoken, self-imposed doctrine: I visit once, I experience once and I move on. Afterwards, whether I’ve loved or loathed the place, I hunt for new pastures, new experiences and rarely, if ever, return. Morocco broke my rules, or at least, made me want to break them. For some absurd reason I feel guilty about the fact that I would readily return every year until the day I die. The fact that I haven’t quite got around to it yet means nothing, because for the first time, I’m craving to revisit a place that had me hooked from the moment I hopped out of the airport taxi. It’s a great comfort that others feel the same. In fact, I’ve only ever spoken to one person who disliked Marrakech, and that was only due to an accidental run-in with some cat urine. Luckily, I had no such experience, and spent a glorious ten days travelling around the city and history-steeped countryside of this North African cultural playground. What did Morocco make me feel? And why does it draw me back? The harsh midday sun bounced off sandstone, forcing me to squint as I lifted my weary head to look for a sign. I’d been walking for what seemed like days. An initial delight in not knowing where I was had quickly turned into a need for water and shelter from the baking afternoon. Alleyways narrowed at every corner until the high walls became barricades, smothering any view of my location. The market stalls, at first filled to bursting with goods and customers ready to do battle in the bartering world, had become scarce, eventually giving way altogether to empty, dusty doorways of deserted homes. Then, my ears filtered the hot silence and grabbed a distant slither of the raucous hustle and bustle that I’d come to expect of Marrakech’s souks. Suddenly, a local businessman straddling a moped buzzed past and I followed eagerly. My aching legs were given a burst of adrenaline in anticipation of returning to the main square. Was my destination obscured by just one final, solitary wall? 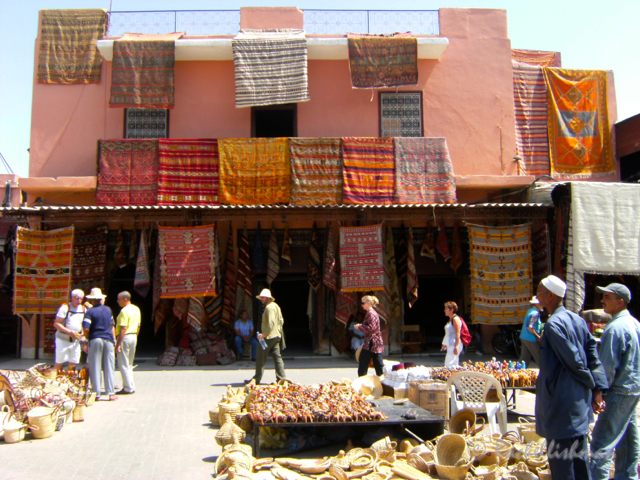 Getting lost in the souks is definitely worthwhile…just take lots of water and sunscreen! The red rock loomed above me and suddenly seemed an impossible task. 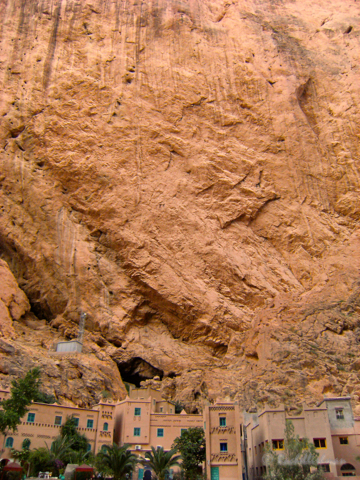 The Todra Gorge was stunning to look at, but the thought of wedging my feet in its crevices and dragging myself up its rusty façade instilled terror. With guidance, and several panicked shouts from below, I slowly zigzagged my way towards my finish point 20 meters from the gorge floor. My profuse sweating, not from the hot day, but the knowledge of the nothingness behind my heels, spurred me to finish quickly. When I did, my exaltation was palpable, and I giggled with achievement and relief. I stirred and was immediately aware of the brightness behind my closed eyelids. I lay still on my mattress. My sleeping bag was pulled up loosely against my chin to quell the desert draft that was whipping up the curve of the dune. I opened my eyes to a sky thick with star clusters. Pale dusty swirls of distant galaxies were clearly visible; barely a speck of blackness was left unlit. I daren’t breathe or blink in case my incredible view disappeared as quickly as it had shown itself. 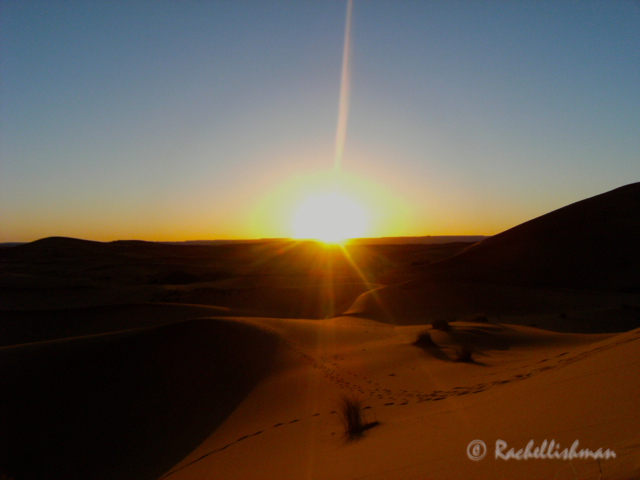 As dawn gradually broke over tall dunes towards the Algerian border I was ecstatically tired. Darkness gave way to a blue-green wash. The night’s performers had returned to the wings for another day. There are some moments that are worth staying awake for. 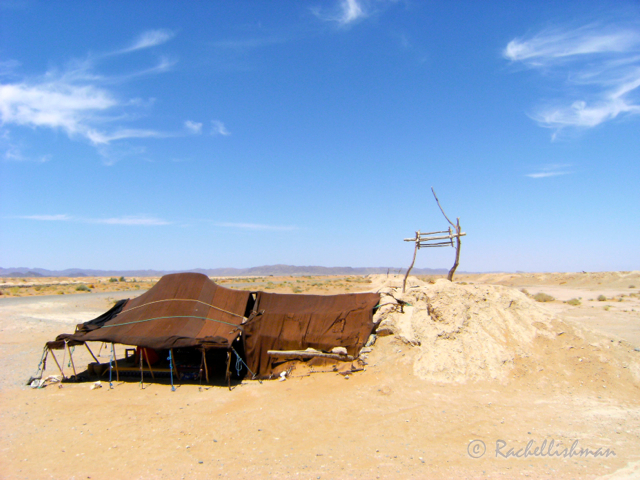 The dark brown tarpaulins of the ‘Place of Relaxation’ bellowed in a hot breeze at the dusty roadside. Its surrounds weren’t sparse, but non-existent. It was framed only by desert and aqua sky. I perched on a cushioned stool and watched as our host delicately poured mint tea, sweeping the ornate teapot high to let a small waterfall fill our cups. The canvas roof provided welcome shade but the scorching wind occasionally seeped underneath, catching me in the throat. I had been transported into a situation that I didn’t fully understand, but I felt extremely calm among my new friends. This little ‘café’ lived up to its name. I wasn’t sure what to expect of a Hamam. Behind closed doors, off the hectic alleyways of the souks, peace is found. I sat in a quiet, hot room of naked women covered in thick brown mud from head to toe. My breasts being on show seemed to matter little to everyone else. I tried to let my British embarrassment seep out of my pores along with the toxins that my human icing was steadily drawing out. Afterwards, a large woman wearing only knickers methodically exfoliated my entire body. Laid out on a cold stone slab, I was completely at her disposal as she worked thoroughly and hummed a haunting melody through her nose. It took the entire bucket of ice-cold water to wake me from the trance she had induced. When I stepped out into the busy streets, my cheeks glowed and my entire body floated above the dusty crowds. There’s something glorious about a massive landscape that gobbles up a little human being. 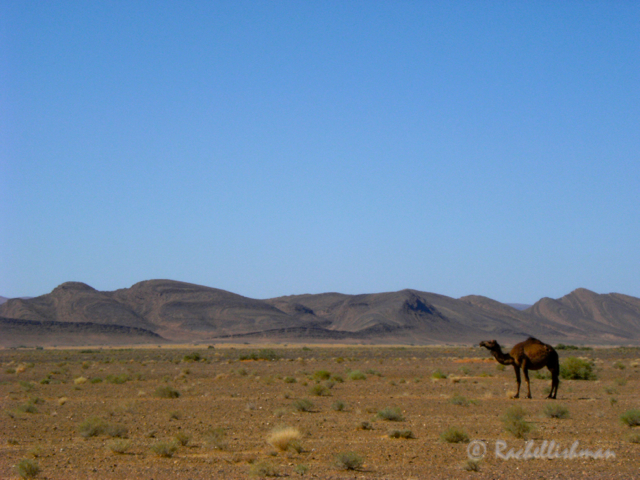 Morocco’s deserts and Atlas Mountains could easily swallow the largest of creatures. Standing with my arms outstretched and head to the sky, I marvelled at my being such a tiny cog in a giant wheel. Our lifetimes are a transient dot against the slopes of rock where ancient fossils lie, still undiscovered. Dunes blown by time and formed over millions of years provide a natural theme park for travellers in the 21st century. We pass through. They remain. Undeterred by our sand boarding, hiking and averagely intrepid camel riding. After the beautiful sensory onslaught of rich spices, night-time illuminations, ancient melodies, blistering air and a zealous exfoliating mitt, I left Morocco stunned. Stunned and a little hurt that Morocco, it seemed, had taken my visit in its stride. So maybe I shouldn’t return to this addictive country immediately. Just like an emotional break-up, I need to give it time. Sounds like Morocco’s got you hooked. I had that aversion to revisiting places until I actually did it. It stems from the idea that the time could be better spent exploring a new place, but it’s never the same experience. I think you’re right Nico, I always try to see somewhere new but there’s a lot to be said for revisiting a place and getting to know it over a long period of time. I have another problem: I always think that I will return to a place sometime later (when?? ), and so I never fully explore. On the other hand, being a self-aware and well-prepared traveler is not exactly my thing anyway. But I do sometimes feel the sting of kind of grief, like when I think of the time I almost got to the very top of the Corno Grande and then convinced myself I didn’t need to overcome my fear of heights then and there (the last 100 m to the top had precipices on both side of the road), cause I would surely return. Needless to say, it doesn’t seem like it will happen anytime soon. “We pass through. They remain.” – this stole my heart. I guess it’s a good dilemma to have…that there are so many places on this earth to explore! What an eloquently made point San – and I completely agree with you. Places are much like people – you never really know which one’s you’re going to have a life-long affair with, or maybe just a passing fling! !